No surprises among the top schools in the country, as evidenced by the new poll released on Monday. Status quo for Minnesota, St. Cloud State, Michigan, Providence, Quinnipiac and Ferris State. Order was restored regarding the number of votes given to the #1 program in the nation, as the Golden Gophers stole back 19 votes for a total of 41 as the calendar turned to December. Last week, in a rare move, the second-ranked Huskies garnered five more first-place nods. Minnesota has won six of its last seven, thanks to a weekend sweep (4-1 and 4-3) over former WCHA foe and now Big Ten opponent Wisconsin, while St. 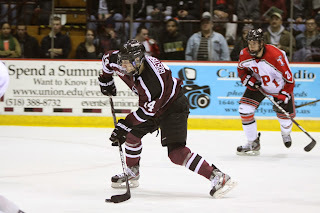 Cloud State enjoyed the week off heading into a two-game set with Minnesota-Duluth this week. The Wolverines blasted Niagara and edged Ohio State at Yost, while the Friars clipped cross-town rival Brown. Last year's national runners-up whipped UMass at home by a 6-1 count, and the Bulldogs finished off an unbeaten November (8-0-2) by beating and tying Northern Michigan. UMass-Lowell rose one spot to #7 after a bye week coming off back-to-back wins over now No. 13 Notre Dame, while Boston College slipped two spots to #9 after a surprising 5-4 home loss to one-time football rival Holy Cross on Friday. It's bound to be a wake-up call with a home-and-home set with New Hampshire looming on the horizon. Yale slid in between those Hockey East stalwarts after topping Merrimack in overtime, while Clarkson was entrenched in the 10-spot after beating Queen's University in an exhibition. Congratulations to Northeastern, which muscled its way into the rankings at #19 after taking down the Fighting Irish by a 3-2 count in South Bend to win the inaugural Shillelagh Tournament. The Huskies tied Western Michigan to reach the title contest. Dutchmen -- who were elevated four slots to 11th in the USA -- featuring Flyers defense prospect Shayne Gostisbehere. On Saturday, the Nits spotted the visitors a three-goal lead but erased it, only to lose by a 4-3 count. Eric Scheid, Patrick Koudys and Kenny Brooks all beat Colin Stevens to forge a tie just after the midway point of the third, but Max Novak potted the winner with 6:50 remaining. One day later, Gostisbehere asserted himself and put together perhaps the finest performance of the season in a 5-4 victory. He unleashed a game-high 12 shots on net and scored a pair of goals in the second period, helping the Dutchmen overcome a 4-1 deficit to win. Daniel Ciampini stuck the final dagger past Eamon McAdam with three seconds to play. Penn State, now 3-7-1 on the season, completed its five-game homestand 1-4-0, and the road does not get any easier with two games, Friday and Saturday, at Wisconsin. Flyers forward prospect Michael Parks was held off the scoreboard this weekend, as North Dakota split two home games against St. Lawrence at the Ralph. Princeton did not fare better against a fellow Big Ten opponent, Michigan State. In East Lansing, the Tigers were embarrassed by scores of 4-1 and 8-2, their record now at a dismal 3-10-0. The bright spot on Friday was senior Andrew Ammon setting up freshman Garrett Skrbich's first collegiate goal, and on Saturday it was Jack Berger and Aaron Ave's tallies. Jersey's own Orange and Black complete their semester slate with a pair of ECAC road games this weekend, at Union and RPI.